Which New Model Of Fosjoas Electric Scooters Do You Prefer? In the current market, FOSJOAS newly released new models are the talk of the customers and scooter-lovers. The two electric self-balancing unicycles are FOSJOAS electric skateboard K1 and electric scooter K2. Moben Global Inc. released the two models at the same time. Harris got the wind of the news about release of the two units. He at once bought the two models. The two models are quite different from other previous models. They borrow some elements of common daily transportation. FOSJOAS K1 adopts the exterior design of the traditional skateboard. Harris is a skateboard-lover. When he was a child, the skateboard was his favourite toy. Another model is transformed from the traditional electricity-assisted scooter. Although the two models borrow the modern elements, they still differ from each other. Harris finds that FOSJOAS electric scooter K1 borrows the element in their childhood. 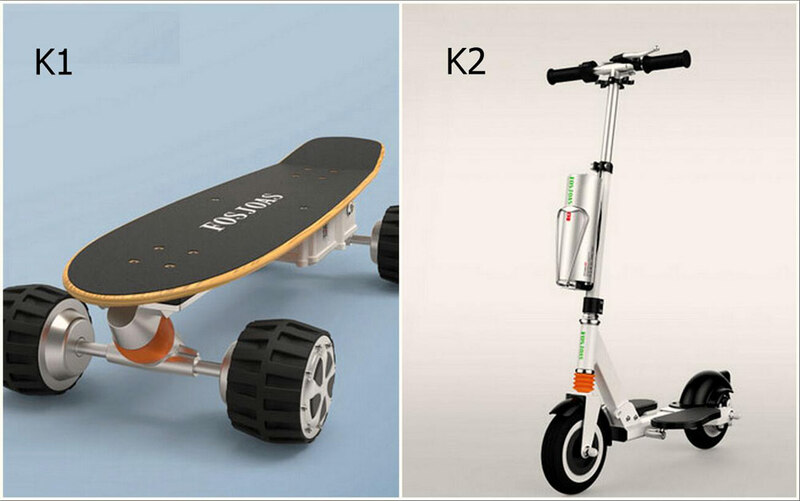 K1 cheap electric skateboard adopts the traditional looks making it more familiar with others. When he sees it, one will be taken back to his children. The memory of the past is very priceless. In order to cherish the memory, those people will try every way to do it. Harris chooses to buy one set of electric skateboard. FOSJOAS K2 is the opposite and it introduces the modern-day elements. Therefore it looks like the electricity-assisted scooter. The two ideas of design represent the language of Moben Global Inc.
Harris discovered they had different functions during the ride. FOSJOAS K1 mainly serves the end of entertainment. On the contrary, FOSJOAS K2 is more practical. Many adult uses FOSJOAS K2 electric scooter as a personal transport. Harris’s sister usually borrowed his K2 to shopping and buying something. Her sister values it very highly. With this handy device, she is never concerned about the issue about parking. At the same time, she will not feel tired because she covers too long. And Harris likes FOSJOAS K1. It brings him back to his childhood. He can perform many amazing postures on FOSJOAS K1. Next：Isabel Rides Fosjoas Electric Scooter K2 In The Pedestrian Street.